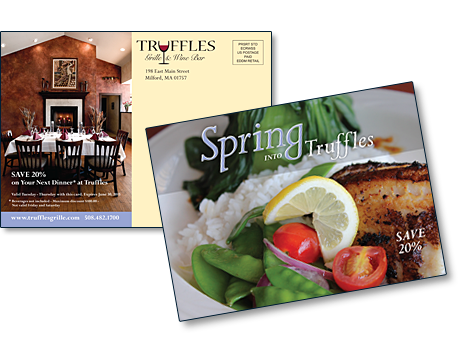 For Truffles Grille & Wine Bar we created a direct mailpiece to promote their spring menu. This piece included a mouth-watering professional photograph of one of their signature dishes and a great shot of part of their dining room on the mailing panel side. Every direct mail piece we design is sent for review by a USPS Mailpiece Design Analyst based on the type of mailing we are designing. Postal regulations are constantly changing, and so we never go to press without a sign-off by the USPS experts. Aside from this, we design not just the look and feel of the piece, but also participate in the concept, from the headline to the copy writing.